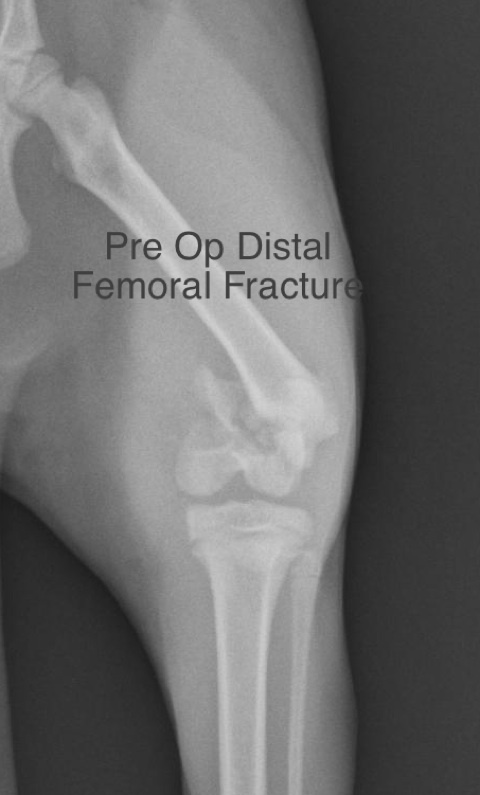 Fractures involving the distal femoral physis are relatively common in immature dogs and cats with the greatest incidence occurring between the ages of 5 and 8 months. Physel fractures have been classified by Salter and Harris into 5 categories: Type 1 traverse the physeal plate through the zone of hypertrophying cartilage; Type 2 involves the physis and continues through the mtaphysis; Type 3 involves the physis and continues through the epiphysis to involve the articular surface; Type 4 involves the articular surface, crosses the physis and continues into the metaphysis; and Type 5 a compression injury to the zone of resting cartilage of the physis. 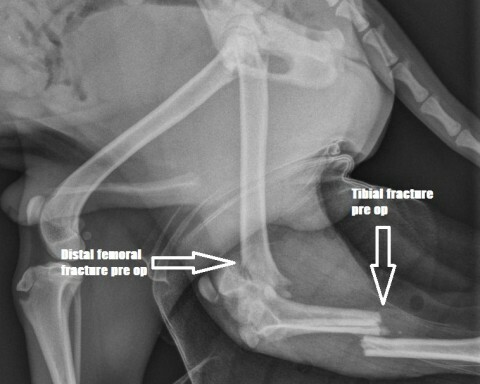 Distal femoral physeal fractures are commonly Types 1 and 2; most physeal fractures in the dog are Type 2 while those in the cat are Type 1. This is due in part to the fact that the distal femoral metaphysis has four projections that correspond to four similar deep depressions in the epiphysis in the dog while in the cat, the projections are flatter and do not interdigitate as deeply with the corresponding epiphyseal depressions. Physeal fractures usually occur through the zone of hypertrophying cartilage, because this zone is characterized by large, vacuolated cells with minimal intercellular matrix. Therefore, this zone is the weakest. A variety of treatment methods have been described for repair of distal femoral physeal fractures including closed reduction and external fixation, normograde or retrograde placement of a single intramedullary pin with or without an anti-rotational Kirshner wire, multiple intramedullary pins, paired Rush pins, Steinman pins, or Kirshner wires employed in Rush pin technique, cross pins, bone plates, and lag screws. The ultimate goal of treatment should be accurate reduction and rigid stabilization of these fractures with as little iatrogenic damage to the germinal cells of the physis and their blood supply as possible. While closed reduction and external fixation may be successful in selected cases, every attempt should be made to satisfactorily stabilize the fracture internally so that early return to function is achieved and restricted joint movement is avoided. When closed reduction and external fixation is used, a good result is the most that one can expect. Surgical exposure for open reduction and internal fixation is achieved via a lateral parapatella approach with reflection of the patella medially. Interference with growth is a consideration in the selection of the method of repair; however, recent studies have suggested that premature closure of the physis occurs more commonly as a result of the initial trauma than the method of treatment employed. 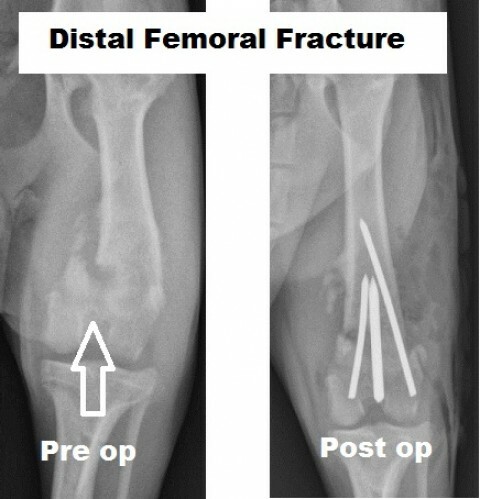 Distal femoral physeal closure normally occurs between six and eight months of age; as the majority of physeal fractures occur in dogs and cats greater than five months of age, over 90 percent of their skeletal growth has already been achieved by the time of injury. Therefore, in animals over five months of age, while some degree of femoral shortening may occur, the overwhelming majority of animals clinically accommodate shortening by a change in stifle or hock angulation. In dogs and cats under five months of age with substantial growth potential, the method of fixation chosen should provide adequate stabilization but should not mechanically bridge the physis. Early implant removal may minimize premature physeal closure. Any implant, which traverses the growth plate, will result in some degree of permanent damage to the growth plate. The least damage occurs when round, smooth, non-threaded implants are placed perpendicularly to the long axis of the growth plate. 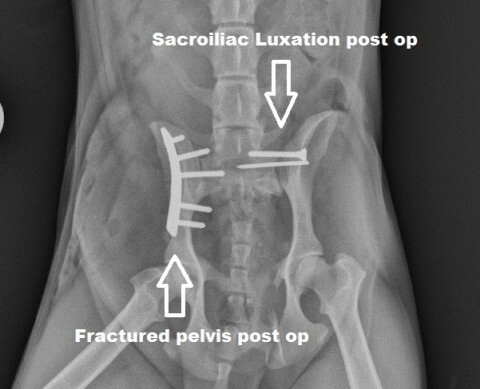 Single intramedullary pin fixation, Rush pinning and modified Rush pin technique, and cross pinning are the most commonly employed techniques used to treat Salter Type 1 and 2 fractures. A single intramedullary pin should provide excellent alignment and stability if the opposing surfaces of the fracture interlock following anatomic reduction. However, in large dogs, single pin fixation may be inadequate to allow early use of the limb. In addition, femoral intramedullary pins existing the trochanteric fossa have been associated with sciatic nerve injury. Normograde pinning of distal femoral physeal fractures is less likely to induce sciatic nerve injury then retrograde pinning. Implant migration may also result in damage to the intra-articular surface of the stifle joint. Although cross pin fixation works well, it is associated with more complications than other techniques including caudal malalignment and/or displacement of the distal fragment and quadriceps tie-down. In very immature animals, cross pin fixation may interfere with physeal growth because of the excessive pin angulation necessary for adequate stabilization. Rush pins provide excellent fixation for distal femoral physeal fractures. Their disadvantage is the need for special instrumentation and the cost of the implants. Rush pins provide three point fixation, thereby increasing stabilization and making their application especially indicated in large dogs. If Rush pins are used in very immature animals, great care must be taken when driving the pins to prevent excessive compression of the germinal cell layer, which may result in growth arrest. Steinman pins or Kirshner wires may be used in exactly the same way as Rush pins. Once the fracture is reduced, the pins are inserted laterally just cranial to the tendon of origin of the long digital extensor muscle, and medially on the distal medial bondyle symmetric to the later pin placement. The pins are alternately advanced in the medullary cavity. I prefer that the pins do not exit the trochanteric fossa so as to minimize the potential complication of sciatic nerve injury. Pre-bending the pins accentuates a three point fixation and results in rigid internal fixation and rotational stability. This technique can be used in very immature animals when fear of Rush pin compression of the germinal layer may be a factor. Such pins may be placed with relative minor trauma to the physis, and most animals continue to lengthen their femurs despite the pins through the growth plate. With proper alignment and internal fixation, an excellent result should be expected. Fractures of the humerus are relatively common in the dog and cat with approximately half of all humeral fractures occurring in the distal portion of the bone. The overwhelming majority of distal humeral fractures involve the elbow joint and are classified according to their anatomic location. Lateral condylar fractures are common and may occur from either minor or severe trauma in dogs and cats of all ages. Because of the close proximity of the thoracic cavity, additional injuries such as pneumothorax, hemothorax, pulmonary contusion, traumatic myocarditis, diaphragmatic hernia, and thoracic wall trauma can occur concurrently with humeral fractures. These potential injuries should be identified and treated appropriately prior to repair of the humeral fracture. The severity of the trauma sustained has been shown to influence the resulting fracture type. While severe trauma has been shown to result in simple lateral condylar fractures and the associated injuries previously mentioned, the majority of lateral condylar fractures result from minor trauma. The high incidence of condylar fractures resulting from minor trauma in immature animals may be explained by the relative weakness of the fusion zones of the principal centers of ossification of the developing distal humerus. A substantial number of condylar fractures, however, occur in adult animals. One study found an increased risk for male Cocker Spaniels over two years of age fracturing their humeral condyle with only minor loading forces. 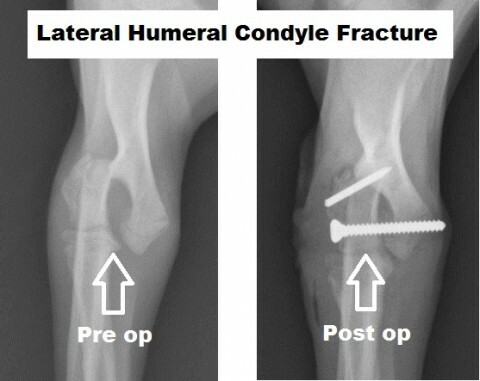 The findings of this study suggest that certain breeds of dogs may be predisposed to distal humeral condylar fractures after sustaining minor trauma equal to or only slightly greater than the loading forces generated by the normal activity. 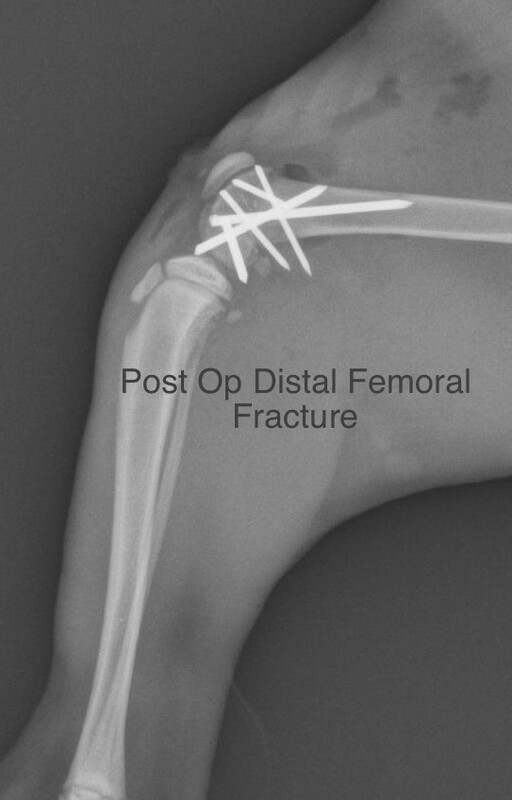 Distal humeral condylar fractures are far more common in dogs than in cats. 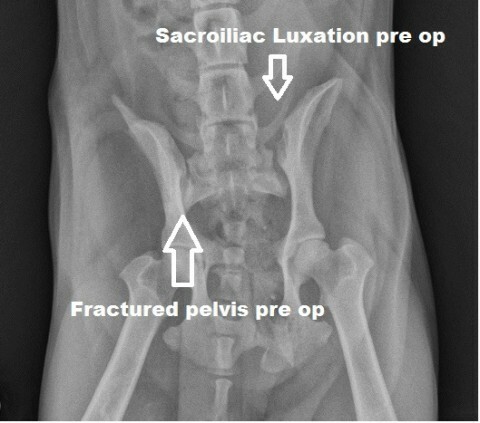 The rarity of condylar fractures in cats may be partially explained by their straighter condyles and relatively wider and thicker epicondylar crests. Fractures of the lateral humeral condyle (capitulum) occur as abnormal compressive forces are directed upward through the radius. The condyle shears off the intercondylar area through the supratrochlear foramen and the lateral supracondylar ridge. Several factors are associated with the higher incidence of lateral versus medial condylar fractures. The capitulum is the major weight-bearing surface because of its articulation with the radial head. As forces are directed through the radius, they are transmitted directly to the capitulum. Fractures of the medial condyle (trochela) are less common because of its less frequent weight bearing position. In addition, the shape of the distal humerus is such that the capitulum sits off the midline of the central axis of the body, predisposing itself in injury. Finally, the lateral supracondylar ridge is smaller and biomechanically weaker than its medial counterpart. Treatment of lateral condylar fractures should be directed at complete restoration of joint anatomy and function. Because these fractures are intraarticular, perfect reduction with interfragmentary compression is required for optimal postoperative function. Closed methods of reduction and external fixation cannot usually reduce the fracture fragments perfectly and prolonged immobilization of the joint, which is necessary for fracture healing may lead to joint stiffness. Closed reduction and stabilization using a condyle clamp to place a transcondylar screw through a stab incision is possible. The results obtained with this technique depend on the length of time since the injury occurred, the expertise and experience of the surgeon, the amount of swelling and edema present, and the amount of soft tissue interposed at the fracture site. Open reduction and internal fixation are indicated for optimal alignment and stabilization of lateral condylar fractures and an early return to function. An early return to function will help alleviate elbow stiffness and degenerative joint disease. While several surgical approaches may be used to expose lateral condylar fractures, excellent exposure with minimal soft tissue dissection is achieved via a lateral or craniolateral approach to the elbow. The most common method employed for repair of lateral condylar fractures is a transcondylar lag screw with or without an additional crosspin for increased rotational stability. Once the fracture site is adequately exposed, fibrin, clots, blood, and interposed soft tissue should be removed to allow perfect anatomic reduction of the articular surface. With the fracture reduced, a transcondylar hole is drilled beginning at a point just cranial and ventral to the palpable lateral epicondylar crest. The drill hole is tapped, the later condylar fragment is over-drilled to create a gliding hole, and transcondylar lag screw is placed. In order to ensure central placement of the lag screw through the condyle, an alternate technique may be employed. The lateral condylar fragment is outwardly rotated and the gliding hole is drilled from the intercondylar fracture surface out through the lateral side of the condyle. The fracture is then reduced, the medial condyle is appropriately drilled, and tapped and a lag screw is placed. An anti-rotational Kirshner wire or Steinman pin is then driven from the lateral condyle and seated into the medial cortex of the distal humeral shaft. The elbow joint should be put through a full range of motion to assess stability and to check for crepitus. I prefer to place the limb in a modified Bobby Jones dressing to help control swelling during the immediate post-operative healing period. The owners are advised to restrict the animal’s exercise for the first 6-8 weeks after surgery while employing gentle, passive physiotherapy to help prevent elbow stiffness. When early surgical intervention, accurate anatomic reduction, and rigid internal fixation are employed a good to excellent result should be expected.